Welcome to your worst nightmares. Everyone&CloseCurlyQuote;s favorite Horror Villains – Freddy Krueger from &OpenCurlyQuote;Nightmare on Elm Street&CloseCurlyQuote;, Jason Voorhees from &OpenCurlyQuote;Friday the 13th&CloseCurlyQuote;, Leatherface from 'The Texas Chainsaw Massacre', Michael Myers from 'Halloween' and Pinnhead from 'Hellraiser' - are ready to haunt your dreams and chase you down. 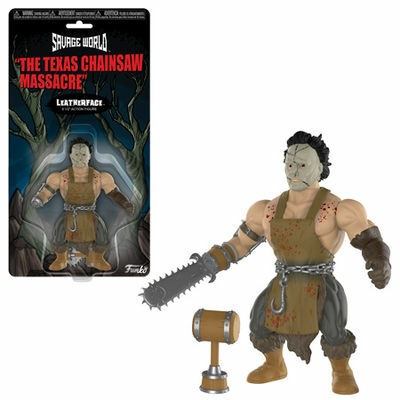 Freddy, Jason, Leatherface, Michael Myers, and Hellriaser are heavily armed and entirely fitting additions to the Funko Savage World line. Legal Notice: Entire contents trademarked (® or TM) and copyrighted (©) 1986-2019 by Things From Another World, Inc. and respective copyright and trademark holders. All rights reserved. Page rendered at 2019-04-19 11:57:02 in 0.301 seconds.